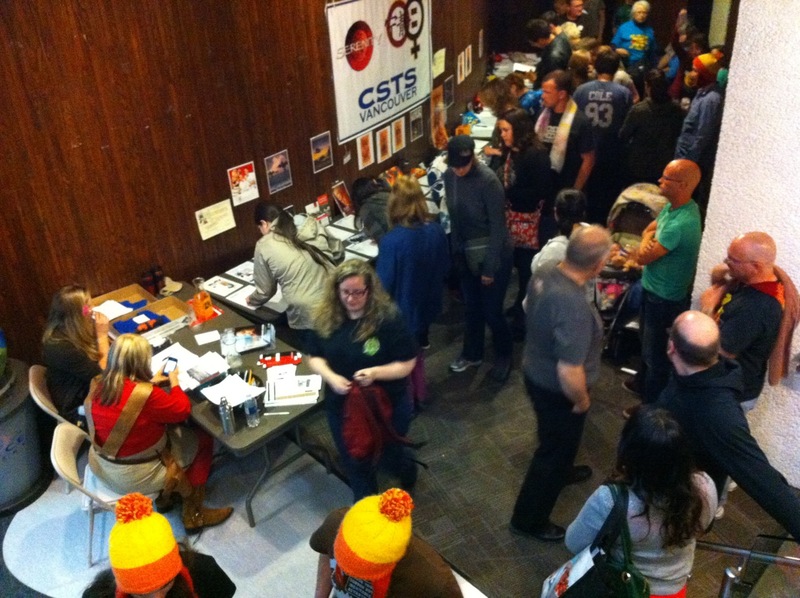 Vancouver Can't Stop The Serenity 2013: Fun and Fundraising! Plus Joss Update. Yesterday I had a wonderful time at the Vancouver Can't Stop The Serenity 2013. Gayle and her team of helpers had prepared a fun-packed day and the atmosphere was welcoming and happy. The sing-along Sing-Along was a traditional way to start everything off and if you've never had the experience of singing "..It's a brand new day, and the sun is high. All the birds are singing that you're gonna die.." with a bunch of other people, then I highly recommend it. 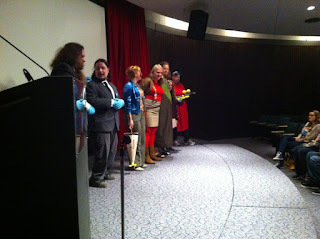 Straight after that was the Evil Laugh Contest, and there were some incredibly strong contenders this year. After each had demonstrated their prowess we were treated to mass laugh-off, which can only be described as a Macabre of Evil Laughs. After that excitement came the Live Auction. 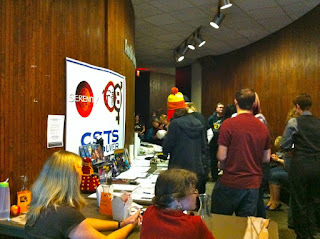 The inaugural auction last year was a huge success, and this year it was MC Alan Douglas (a.k.a. @alalcoolj, The Masked Roger and Father Aloysius Rambo) who whipped up the crowd into a bidding frenzy. With many cries of "Signed by Jewel Staite, you say?" 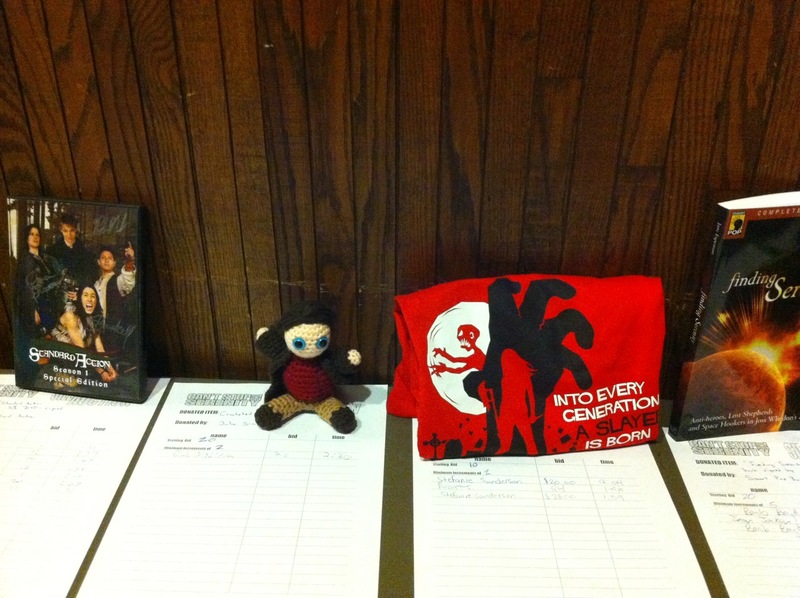 the magnificent prizes were snapped up by an eager mob. In the end Kaylee, Malinda and Inaru all claimed prizes. I had neglected to buy my Bingo cards in time (and not just because I was lining up to sample the sweet treats from C & C Cakery which were, as it happens, delicious), so I could sit back and enjoy the Alan Douglas challenging and delighting the audience with some well-thought-out Whedon Trivia Bingo. The tension in the room was palpable, and after a couple of false dawns, there was a clutch of Bingos all at once. Once time was called, it was on to the Main Event. 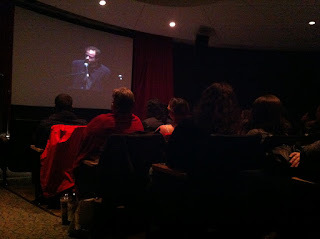 A screening of Joss' Equality Now speech, the CSTS 2013 Equality Now introduction, and then on to Serenity. 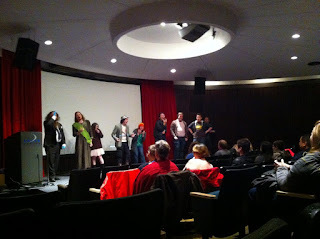 And, again, if you've never watched Serenity with a crowd of Browncoats you are missing a rare treat. I can't thank Gayle and her team enough for such a wonderful day out and I hope everyone enjoyed a well-earned rest today! 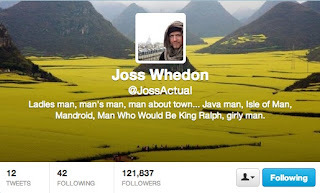 A couple of weeks ago I blogged about the fact that Joss is now on Twitter, and how conflicted I felt about that. Well, sad to say that the @JossActual account has now been made private (I'm sure it wasn't anything to do with that post...). So great, that when they changed it everyone thought it was awesome and everyone loved it the worst thing ever probably not that bad if they sort out the subscription issues. I wanted to blog about the 2013 CSTS Vancouver event that's happening on Saturday, and since I have two sets of photos from the 2012 and 2010 events on Flickr I was going to add slideshows for them. In the old Flickr it was pretty easy. Go to the set, view the slideshow and the link to share it appeared in the top right-hand corner. Now, I consider myself to be pretty savvy with software. I teach people how to use many different programs, and I'm pretty good at it. But it took me more than 15 minutes to work out how to share using the new Flickr, and I think that's way too long. The only reason I kept searching is that I was sure I would have heard people complaining about it. I don't want you to have to go through the same thing. 6. You are good to go! Let me know how you got on, and Happy Flickring! We've been attending the Vancouver CSTS event since 2008, and every year we have a ton of fun with costumes, auctions, sing-alongs and, of couse, seeing Serenity on the big screen one more time with the BC Browncoats and friends. The 8th Annual Vancouver CSTS is on Saturday May 25, 12:30 - 5:30 PM at the MacMillan Space Centre, and promises to be another awesome event. Check out the awesome auction items on the CSTS Vancouver blog - and find out how you can take part! 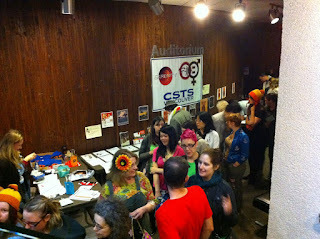 Keep up to date with all the excitement by following @CSTSVancouver on Twitter, too. Come and join us on Saturday! Want to work with Felicia Day and Jenni Powell? Try Geek & Sundry's new channel! UPDATE: The link to the SUBMISSIONS page is now working! Are you going to give it a go? If you've been waiting for your big chance to break into the next level on YouTube, then you need to know about a hugely exciting opportunity that has just been announced. It kind of gets better, if that’s possible. These lucky vloggers? They’re not vlogging for us in a vacuum. Each of the twenty vloggers will be personally mentored by Miss Felicia Day herself, as well as the extremely talented and very awesome Jenni Powell, who hails from the Lizzie Bennet Diaries. (Squee?) Vloggers will have access to marketing training, extra promotion, exclusive collaborations, opportunities for access to events, resources, and even a per-video stipend. Yeah, totally dream job, right?! 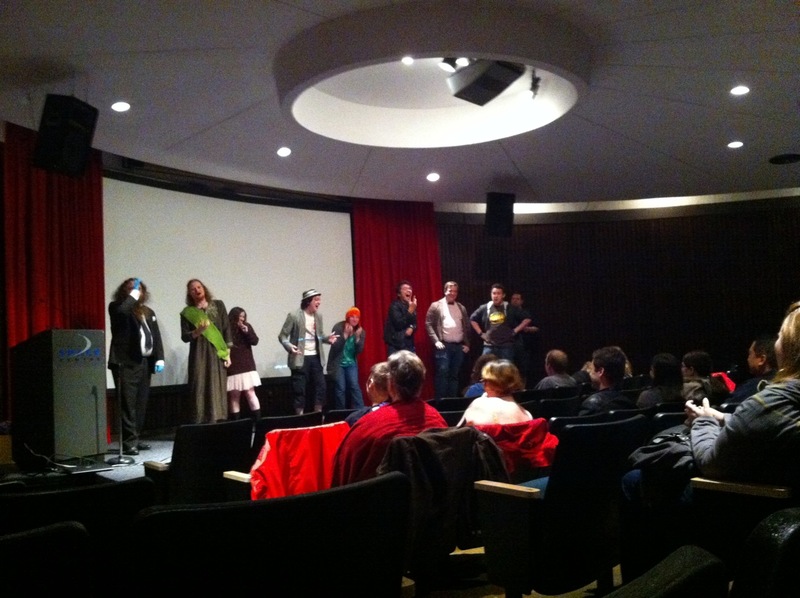 But, but … how can I be a part of Geek & Sundry Vlogs? You ask, stomping your foot in the Wonka Chocolate Factory … You’re in luck, Miss Veruca Salt. We’re accepting submissions for new vloggers all summer long! How often do you get the chance to work with such talented people? Felicia Day has won so many awards and accolades for her work, and she has always been focussed on giving back to the community. Jenni Powell is another powerhouse with years of experience developing and creating online work, and is one of the founders of Celebrate The Web. They are fantastic people to work with and this is a huge opportunity. 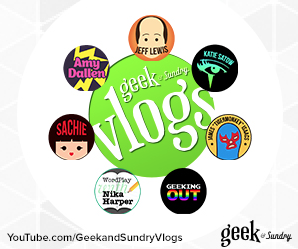 If you have a current Vlog, or have been preparing to set one up, then you need to head over to the Geek & Sundry website. The submission page is due to be up today (May 20th) and as soon as it is I'll update this page with the link. In the meantime check out the new Vlogs that are already there! It would be funny if it wasn't so...no, actually it is funny. But also a little sad. 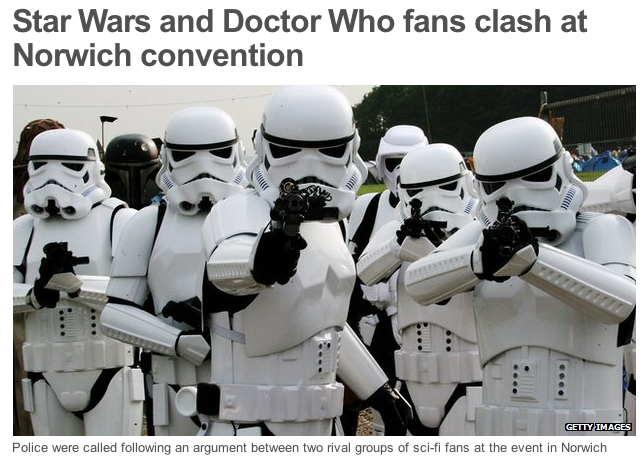 Fandoms gone wild have made the headlines in the UK. 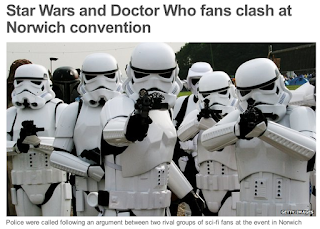 The 4th Annual Norwich Sci-Fi convention was the venue for a showdown between Dr Who fans and Star Wars fans. 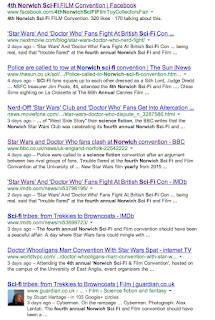 It has been widely reported from such bastions of hard news at The Guardian and the BBC, to IMBd (who knew they blogged?!?) and The Sun (nuff said). No word from Alan Partridge as we go to press. And people wonder why fans get upset? 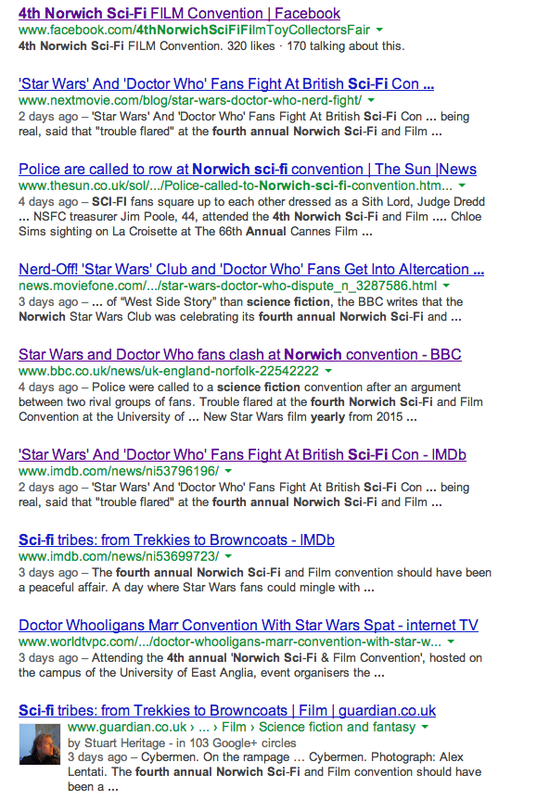 Dominic Warner, secretary of Norwich Star Wars Club, said: "It's been blown up as if it was a fight. There was no fighting." He acknowledged there had been disputes between club members in the past, but said: "There is no bad feeling between the two clubs. 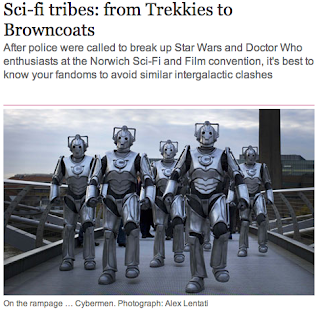 We have never interfered with them. "It does sound comical. 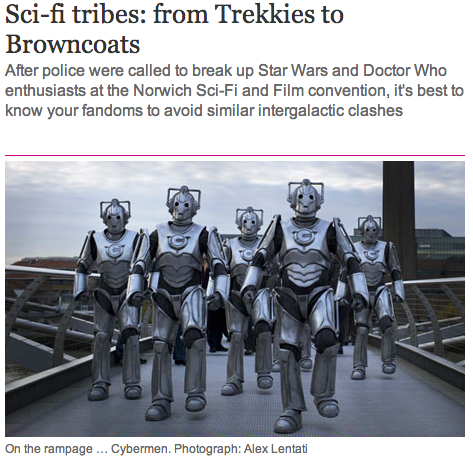 People that dress up in costume are labelled geeks and some people laugh at us, and this just makes it even more so." So there we have it. No battle, just a little turf war. Whooligans? Hardly. They wouldn't Hurt a Firefly. And speaking of Browncoats - don't forget that the Can't Stop The Serenity Charity Screening in NEXT WEEKEND, May 21st. There are some fantastic auction items up for grabs so get your tickets now and we'll see you there! Joss, Actual. 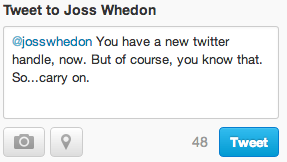 Joss Whedon joins Twitter and apparently the world keeps spinning. IMPORTANT UPDATE - Joss has moved on. It's over five years since I started this blog. Why did I start it? Because of Joss Whedon. Factual. The first post I made here is titled "numfar, do the dance of shame......" and if that doesn't mean anything to you, then you're probably in the wrong place. Joss introduced me to Felicia. And Felicia introduced me to so many amazing and wonderful people that the past five years have been filled with adventure. When I was covering Dr Horrible I often wondered how awesome it would be if Joss had been on Twitter, and how much fun it would have been to see the Fail Whale called to action again and again. In the past I have gently poked fun at the fact that I never thought I would see the day that Mr Whedon Mr J Whedon Joss Whedon would ever take up any form of Social Media. And I may have hinted that he was incapable of wresting utility from this dread technology. But, dear reader, I was wrong. Very wrong. I should be tweeting my brains out! Truth be told, I'm a bit sad. Not having Joss on Twitter meant something. It meant that he was too busy working to care about new things, and we still had something that was not mainstream. And it didn't matter about doing silly stuff because no one would ever know. My writerlyness has given out, and this is more than I meant to say, anyway. Weekend Movies - No reviews, just reaction. 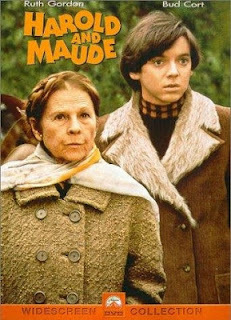 Harold and Maude. And this blog is still here! A lot has happened in the five years since I first started here, and my reasons for doing it have faded over time. So many new distractions, and not all of them Social Media apps. Recently, though, we've had time to actually sit down and watch a few movies. We're counting down to cutting the cable cord when the contract runs out, so we've been making use of Netflix, Apple TV and Telus On Demand. You can buy Harold and Maude from iTunes but you might even still have an old VHS tape of it somewhere. If you do, dust if off and give it a whirl, you are in for a rare treat. I first saw this movie a loooong time ago. Many of the details, and indeed main parts, were misremembered or missing. But it was completely captivating from the arresting first scene to the end credits. And the music! Cat Stevens at his finest, and that song from 'Extras' that had haunted me every time I heard it, finally placed. I don't even know how to categorise this. It is a love story, but so much more. And it is funny, and surprising, and hugely touching. Just watch it, and tell me what you think. It's definitely going on the 'Approved Films' list. If you watched it for the first time, was it anything like how you thought it would be? I can't really remember what I thought the first time I watched it, but it really stuck in my mind as a wonderful love story, a cautionary tale and a celebration. Re-watching brought all that back plus a big dose of nostalgia. The clothes, the music, the sets, the cars, the colours. Everything was perfect. I can't remember the last time I saw a movie where the main protagonist was an older woman. Think about that. At first glance this film is about a dislocated young man trying to find his way in an uncaring, yet pampered, world. But really it is all about Maude, even though we are left with so many questions about her and her life. We need more people like Maude in the world. And more movies about them.